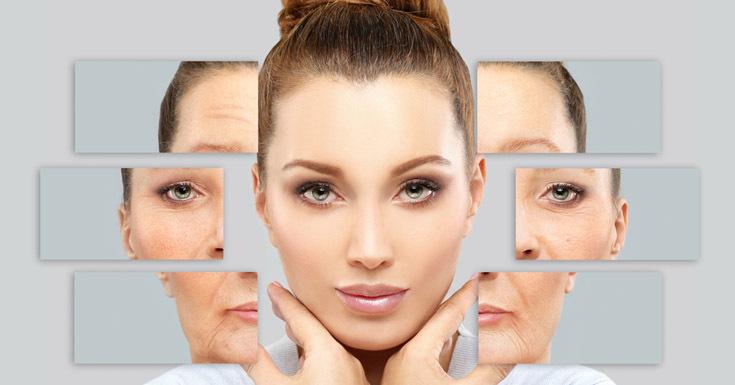 As we age, are skin begins to show fine lines, creases, folds or ridges. These visible lines are called wrinkles. They usually occur as you get older, but age is not the only thing that contributes to wrinkles. Your skin will also wrinkle temporarily after being soaked in water for a prolonged amount of time. Although there are things you can do to prevent wrinkles from occurring, they are an inevitable part of the natural aging process. Wrinkles occur because your skin gets thinner, drier and loses its natural elasticity as you age. When this happens, your skin’s ability to protect itself is reduced. Your genetic makeup may also influence how early you will develop wrinkles and where you will develop them. Wrinkles most commonly appear on the back of the hands, face, neck and the top of the forearms. The two main types of are surface lines and deep furrows. Some effective wrinkle treatments can help reduce the appearance of fine lines, but more aggressive techniques are required for deeper creases. What are the Main Factors That Cause Wrinkles? There are several factors that cause wrinkles. Sun damage, smoking, dehydration and certain medications are strong factors in the development of wrinkles. In addition to outer elements, wrinkles are just part of the normal aging process. Smoking is thought to accelerate the aging process. This is due to the chemicals found in tobacco cigarettes along with the reduced blood supply to the skin. People with lighter skin are more sensitive to the sun’s damage and may develop wrinkles sooner than someone with darker skin. When looking at whether or not you will develop wrinkles, look at your parents. At what age did they begin to develop wrinkles? This is a good indication of when you will start to develop fine lines and wrinkles. Believe it or not, your hair style can also factor in wrinkle development. Certain hair styles provide a certain amount of shade to your face over others. Hats and long sleeved shirts can also help protect the body from the rays of the sun. Your job may also be a factor. Jobs where you work outside, especially by water, can create prolonged sun exposure. Finally, common facial expressions can also contribute to wrinkles. Repeatedly smiling, frowning or squinting can create fine lines and wrinkles. When and Where Wrinkles Start Appearing? 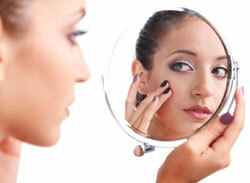 It is not uncommon for people to wonder about what age they can expect to start to see wrinkles. It is more commonly a concern of women. Unfortunately, by the time many people start to think about wrinkles, some of their habits have already contributed. It is important to take care of your skin at an early age in order to help combat wrinkles. Natural aging is also called intrinsic aging. Everyone ages and everyone will develop wrinkles at some point in their life. Wrinkles actually begin to form in the late 20s. At this point, the production of collagen begins to slow and skin elasticity begins to weaken. Wrinkles do not show immediately, so prevention is often overlooked. As time goes on, you will see certain signs of intrinsic aging, including fine lines and wrinkles, transparent or thin skin, underlying fat loss, dry and itchy skin, sagging skin, graying hair and changes to the nails. What Is The Normal Age To Start Noticing Wrinkles? Most people begin to notice wrinkles by the age of 30, but depending on your lifestyle habits and your genes, it is possible to notice wrinkles as early as age 25. It doesn’t surprise me that the worst area is around your eyes and between your brows. The under eye area is very delicate and in some cases, fine lines and wrinkles can appear in this area as early as your teen years. Patients who struggle with premature under eye wrinkling can try laser resurfacing. If you spend a lot of time in the sun and/or you are a tobacco smoker, it is likely that you will see facial wrinkles at an earlier age than those who do not smoke and tend to stay out of the sun. Stress can also cause wrinkles. There is no exact age for noticing wrinkles. Our bodies are all different and so are our lifestyles. I would recommend that you see a dermatologist to find out what your options are. You should also kick any nasty habits you have that may be causing facial wrinkles (i.e. smoking, spending too much time unprotected in the sun, etc.). Depending on the severity of your wrinkles, your dermatologist may recommend various treatments. Botox can be used to treat crow’s feet (fine lines and wrinkles around the outer corner of the eyes). Restylane is often used to treat dark under eye circles (i.e. bags). Laser resurfacing and surgery may also be options. Know how to reduce wrinkles at any age, inspect the Plexaderm Review at once that will tell you how to treat with aging, fine lines, and puffiness around the eyes. Additionally, there are many actions you can take at home to help not only prevent further wrinkles from forming, but also help reduce the appearance of current fine lines and wrinkles. For instance, it is very important that you protect your skin from the elements. That means the sun and harsh, cold weather (which can chap the skin). Wear protective clothing, such as hats, long-sleeved shirts and sunglasses. Use sunscreen whenever you are planning to go outdoors. Try to stay out of the sun when it is at its peak, which is anywhere from 2 p.m. until 4 p.m., depending on your time zone. You also need to start a good skincare regimen. If you’ve already been using one, consider whether or not the products you are using are 1) good choices for your skin type, 2) do what you need them to do, and 3) contain the ingredients necessary to produce the results you want. Speak to your dermatologist for help with this. You should also be aware that there are some prescription products that may be beneficial to your home skincare regimen. You may also want to consider the possibility of a condition called blepharochalasis, which is related to recurrent swelling. Patients who suffer from blepharochalasis tend to not do as well with treatments. If you decide to go with professional treatment, make sure your treatment preserves as much of the periorbital fat, muscle and tissue as possible. There is a possibility that you would be a good candidate for conservative filler, but many patients start with Botox, which causes virtually no recuperation time. You can also take a glance at anti wrinkle cream reviews before taking any decision. For women trying to conceal the signs of aging, the most important rule is less is more. Heavy foundations and powders will create a negative look. By using lighter amounts of makeup, women can downplay their facial flaws. Heavier makeup only highlights wrinkles, which is not what we want. Consider using a tinted moisturizer, which provides lighter coverage and doesn’t settle into the creases of your wrinkles. It also won’t cling to facial hair. Only use this type of product on the parts of your face that needs it. Choose a shade that is one to two times darker than your actual skin tone, because lighter shades will again highlight your wrinkles. Make your eyes the focal point of your face. If you do nothing else before going outside, use a tinted moisturizer and highlight your eyes to draw attention away from other facial flaws. Your eyes should pop. You can also have a look on some best anti wrinkle cream reviews, it may also support you to avert you from wrinkle appearance. A good skincare regimen is important, no matter what your age. There are a few misconceptions about skincare. The first is that skincare is for women and not for men. This is simply not true. Men need to be just as conscientious about skincare as women. The second misconception is that once the wrinkles have appeared, your window for good skincare has passed. It is true that you can’t do much to get rid of the wrinkles once they’ve appeared, but you can take measures to reducing the risk of further wrinkles appearing. Use sunscreen when you’re planning on spending time outside. Remember that the rays of the sun can damage your skin through your car window even on cloudy days. You should cleanse, moisturize and tone your skin each morning and each night. For women, it is especially important that they do not go to bed at night with makeup on. Makeup helps protect your skin during the day, but can age your skin if worn at night. Consumer Reports tested seven anti-wrinkle creams, one control cream and a moisturizer with no anti-wrinkle claims. They used 79 subjects (67 women and 12 men). Each used a different product on each side of their face. The creams were applied each morning for 12 weeks. The test subjects were evaluated by six trained sensory panelists. All seven creams had little effect and they did not work on everyone. Garnier, L’Oréal Paris and Lakme had the most positive short-term improvement. Test panelists agreed they would buy Neutrogena moisturizer as a control agent. You may also give a try to anti wrinkle cream such as Perricone MD Cold Plasma. Click here to know more about it. Does Chewing Gum Cause Wrinkles? Wrinkles are caused by several contributing factors. The primary causes being the natural aging process, changes in hormonal levels, and slower process of skin repair. There are some other causes including exposure to harmful UV rays, poor skin hygiene and skin care regimen, poor nutrition, and lack of exercise, to name a few. According to Dr. Joel Schlessinger, habitual gum chewers form traces of fine lines around their mouth area, particularly noticeable on the side of the mouth typically used when chewing gum. He argues that gum chewers develop wrinkles prematurely as a result of overused facial muscles which, in turn, causes facial skin to sag and lose elasticity thereby supporting the formation of fine lines. Dr. Joel Schlessinger is a dermatologist and cosmetic surgeon practicing in Nebraska. He is also the founder of Skin Specialists, P.C., the Advanced Skin Research Centre, the LovelySkin Spa, LovelySkin.com, and LovelySkin retail store. He is also President Emeritus of the American Society of Cosmetic Dermatology and Aesthetic Surgery1. Celebrated Hollywood Dermatologist Jessica Wu shares Dr. Schlessinger’s opinion that regular gum chewing causes wrinkles, particularly on the upper lip. She adds that too much gum chewing can cause muscles around the jaw area to bulge. Other skin care specialists think otherwise. For instance, Japanese author Chizu Saeki, who wrote “The Japanese Skincare Revolution”, recommends gum chewing to exercise facial muscles. She further suggests to deliberately chew gum regularly for 5 to 20 minutes to help improve blood circulation around the mouth area which, in turn, helps prevent wrinkles from forming. Chizu Saeki is a beauty consultant and an experienced aesthetician. After all, several studies in the past have shown, and doctors now agree, that gum chewing results to several health benefits which includes relieving stress, increasing alertness, improving attention and focus, promoting weight management, and improving oral health. Gum companies, in recognizing these benefits even came up with sugar-free gums. Chewing gum helps prevent carries from forming by aiding in the removal of food residues. It also helps fight carries from worsening. Gum chewing has also been shown to help smokers quit the habit, with gums used as an alternative to fight the impulse of lighting up cigarettes. People who frequently suffer from headaches and migraine attacks also commonly chew gums to help exercise tired muscles and stimulate veins on and around the face and temples. Although some headache sufferers also claim that chewing gum seems to trigger their headaches but, that may be more due to the gum content rather than the act of chewing itself. If you’ve been chewing gums, there seems to be no alarming reason why you should stop the habit. You probably should focus more on correcting other bad habits that may be contributing to the lines on your face rather than being bothered by gum chewing. 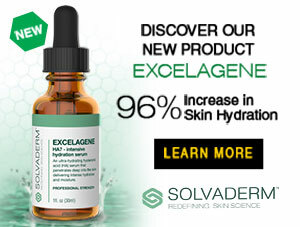 Some of the things which you can start doing regularly to prevent early signs of skin aging are: wear sunscreen during daytime even when it’s cloudy, keep skin ultra-hydrated with creams and moisturizers like StriVectin SD, make it a habit to eat healthy, exercise regularly, quit smoking, and avoid drinking too much alcohol too frequently. 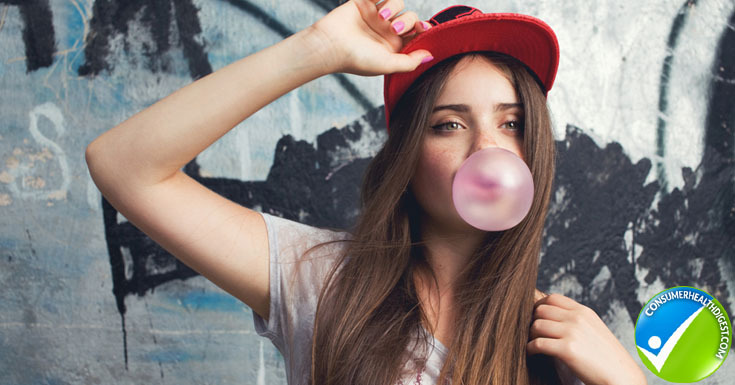 So does chewing gum really hasten the appearance of wrinkles and fine lines or doesn’t it? Repeated facial expressions like smiling, squinting or, frowning do leave marks on your skin overtime. However, it is also a fact that exercising strengthens skin tissues and can help improve skin elasticity, even if that only means exercising your jaws. For this grey area in skin care, where both claims have weight, it’s alright to chew gums just refrain from popping a gum in your mouth one after the other. Too much chewing can harm your skin but no chewing at all means depriving your skin of the benefits it can derive from gum chewing. Plexaderm can be used to treat the wrinkles if you want to prevent the lines and wrinkles by creams than you may try it once. Therefore, when it comes to gum chewing, we say, chew in moderation!